Either Xander Schauffele (above) or Tony Finau is likely to get the final roster spot on the United States Ryder Cup team. 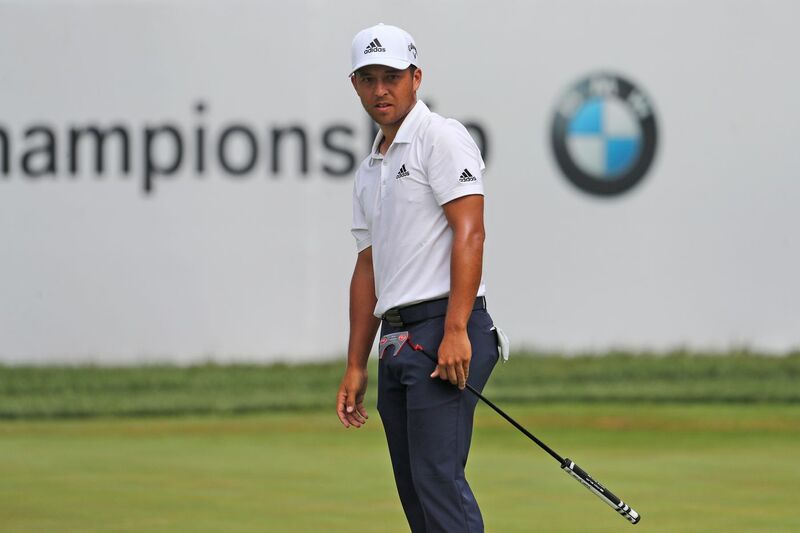 End of season tournaments like this week's BMW Championship are a little like J.J. Abrams' productions. There's a whole lot bubbling beneath the surface. At Aronimink Golf Club, for example, where Round 2 of this FedEx Cup playoff event took place Friday, there are 69 players fighting for 30 spots in the Tour Championship, a few dozen in position to win here, a couple still in the running for player of the year and, maybe most intriguingly, two competing for the final Ryder Cup spot. It's no secret that when captain Jim Furyk makes the announcement Monday, the 12th player on his 2018 U.S. Ryder Cup team figures to be either Tony Finau or Xander Schauffele. Friday, minutes after each shot a 64 on a course that overnight rain made even more receptive, the two-20-somethings found themselves simultaneously assessing their match race. For background, the top eight in Ryder Cup points were automatic picks. Furyk this week chose to add the next three in the rankings — Bryson DeChambeau, Phil Mickelson and Tiger Woods. That left a single opening. Schauffele is No. 12, Finau 15. But Finau, 28, is higher in the world (17 to 20) and FedEx (4 to 41) rankings and has been hotter and more consistent than his 24-year-old rival. In fact, on Thursday, the soft-spoken Schauffele sounded as if he were conceding the spot, calling Finau, who at 7th is 17 spots ahead of him on the money list, "an ATM or Top 10 machine." "I'm sort of in a position where I feel like a win is the only way I'd even be in consideration," Schauffele said Friday after a seven-birdie 64 put him atop the leaderboard with a 13-under 137. "I mean Tony obviously is the guy right now. He's not making it easy." When Finau was relayed Schauffele's comments, he chalked them up to Tour diplomacy. "He's being nice and I'm sure he's being a little bit generous," said Finau. "I've played some nice golf and that's all you can do. Obviously I'm cheering for myself as much as anybody is. But my hope is I win this tournament. I know if I do that, then everything just takes care of itself." Finau, a Utah native, matched his rival's 64 Friday. It was, he said Schauffele's hot start — 5 birdies in his opening seven holes — that motivated him. "I needed that round today," said Finau, who shot 68 Thursday and now stands 5 back of the leader. "Xander got off to a great start. We saw him get to 11-, 12-under really fast and next thing I know I'm 8 shots back. He really set the pace early. I was happy to make a run late, but I'm still a handful of shots back going into the weekend." Oddly, these two young talents seem to have handled the added pressures a Ryder Cup year can bring in different ways. Finau said he "enjoyed it", while Schauffele, who won last year's Tour Championship, admitted he had let it effect him. "I didn't handle that very well," he said. And so, with two days left in the BMW and one coveted spot remaining on a team both have dreamed of playing on, they will both attack a near-defenseless Aronimink this weekend and hope that Furyk calls. "I'm trying to focus on what's going on here right now," Finau said. "The possibilities are cool of what could happen. But nothing good comes from thinking way too far ahead. I've got 36 holes to try and win this tournament. And winning will take care of everything.